Haitham Mohamedain is a prominent Egyptian labour lawyer and member of the Revolutionary Socialists who has been unjustly jailed repeatedly by the military regime led by President Abdul-Fattah el-Sisi. In April, Mohamedain was detained again as part of a crackdown on a new wave of protests against the Sisi regime, including its transfer of two Red Sea islands to Saudi Arabia. Palestinians and their supporters gathered on November 15 at Federation Square in Melbourne to celebrate the Palestinian National Day. The Palestinian flag was raised for the first time ever in Melbourne and stood next to seven other Palestinian flags. The world was again entering an era of “dark capitalist and imperialist barbarism” which acts against human dignity, the integrity of Mother Earth and the sovereignty of countries, Bolivian President Evo Morales told the United Nations General Assembly on September 21. Morales, Bolivia’s first indigenous president, called for a “new world order” that, rather than building walls, built a global citizenry where all people live together as a common family. 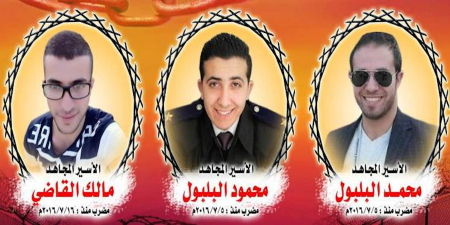 Hunger striking prisoners Malik al-Qadi, Mahmoud al-Balboul and Mohammad al-Balboul. In Bethlehem, hundreds of people participated in a march in solidarity with three Palestinian political prisoners on hunger strike, IMEMC news said on September 6. Chanting “I love Celtics”, Palestinians have released a video praising the fans of Scottish football team Celtic FC for “one of the biggest solidarity actions in European football history”. It came as Celtic fans raised more than £100,000 by August 23 for Medical Aid Palestine — who deliver health and medical care to those “worse affected by conflict, occupation and displacement” — as well as to the Lajee Center for equipment to start a youth league, TeleSUR English said that day.